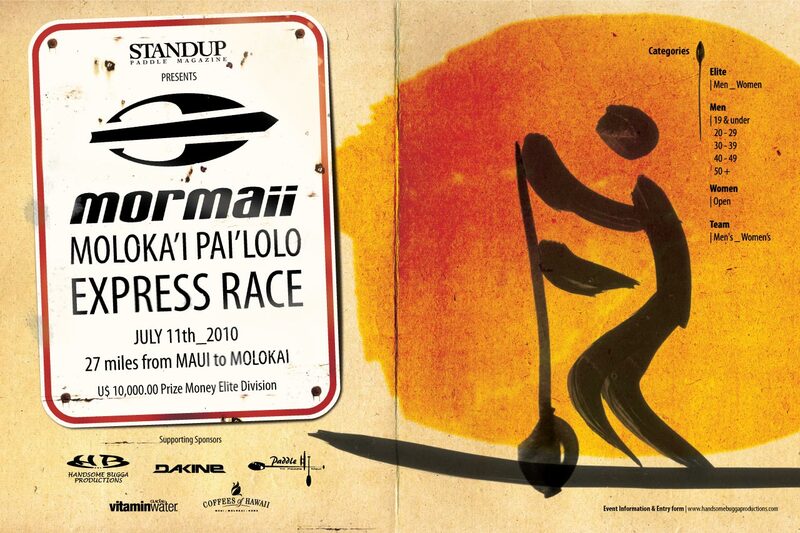 The Mormaii Molokai Pailolo Express Race presented by Standup Paddle Magazine lived up to expectation Sunday as gusts as high as 20 knots delivered the goods for 28 Elite paddlers. 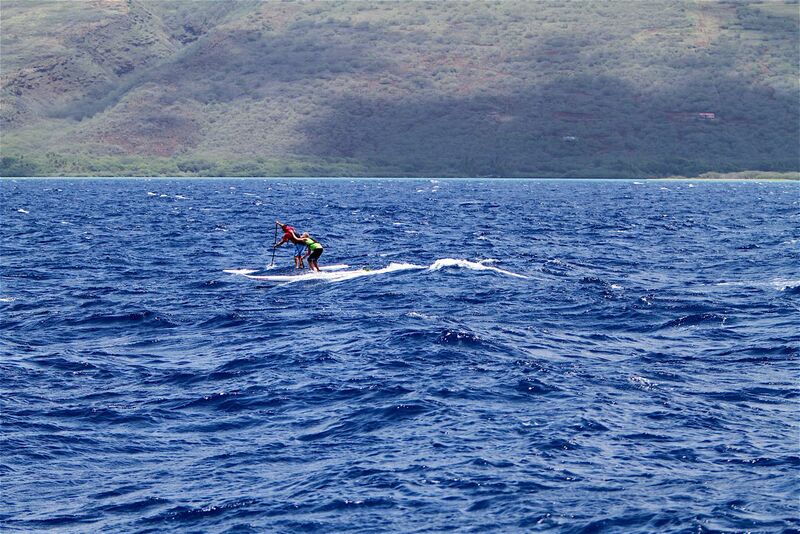 Known for it’s “Lolo” (crazy) running current and wind, the 10:10 AM start gave way to a light mist at the line from Honolua Bay, Maui with a sense of calmness before heading straight into the rum line. 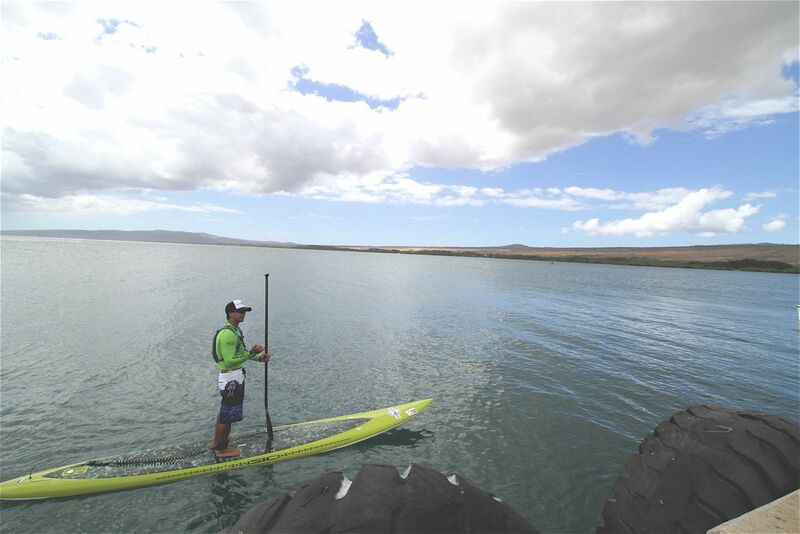 Some of the world’s best including Maui’s Dave Kalama, Mark Raaphorst, Scott Trudon, Connor Baxter, Jeremy Riggs, along with Molokai’s Ekolu Kalama, Brazilians Livio Menelau and Andrea Moller assured everyone that this was not going to be another weekend get together paddle race and took off on various lines to Molokai so they could get on the Pailolo Express which runs along from mid channel of the islands and straight toward Kaunakakai Harbor. Just how prepared are these Elite? 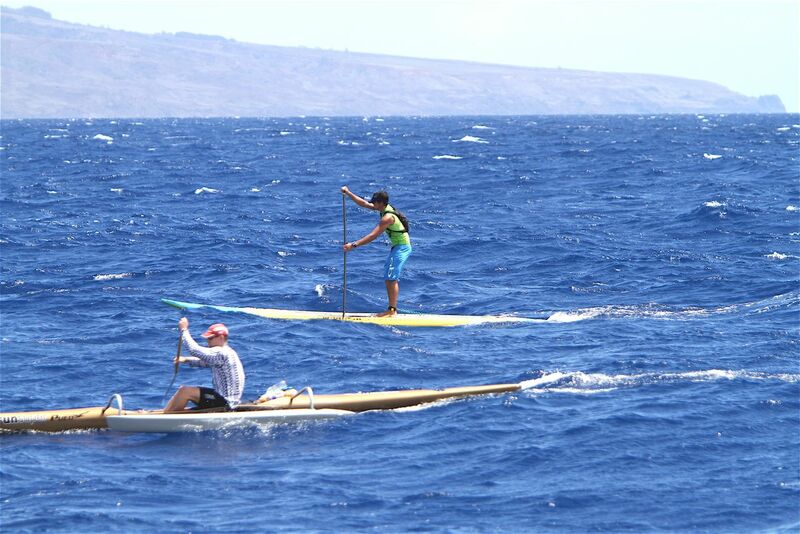 Several paddlers including Dave Kalama, Trudon, Menelau, Trudon geared themselves with two hydration packs and power gels to last the 27-mile crossing knowing there would be no stopping or support boat along the way. 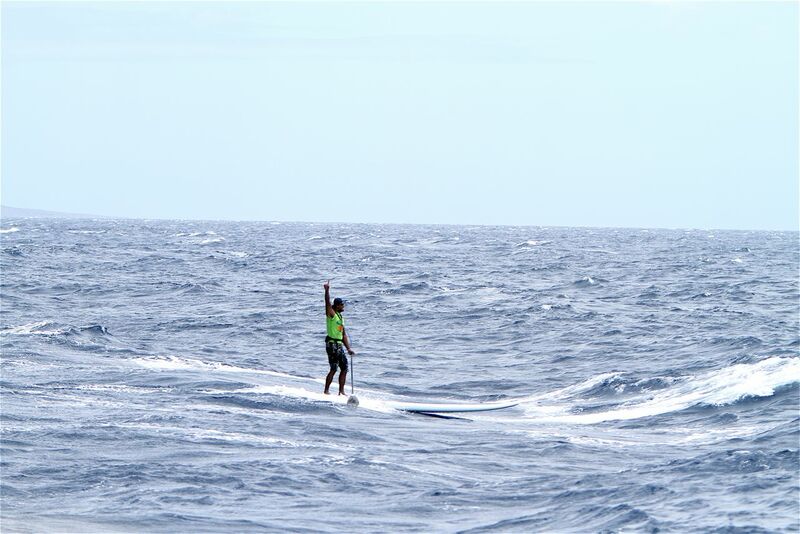 For Honolulu paddler, Koliah Jardine who made the decision to paddle the race the day prior, the crossing became a test of endurance as his water pack malfunctioned an hour into the channel and it became a game of mind and body over dehydration and defeat. 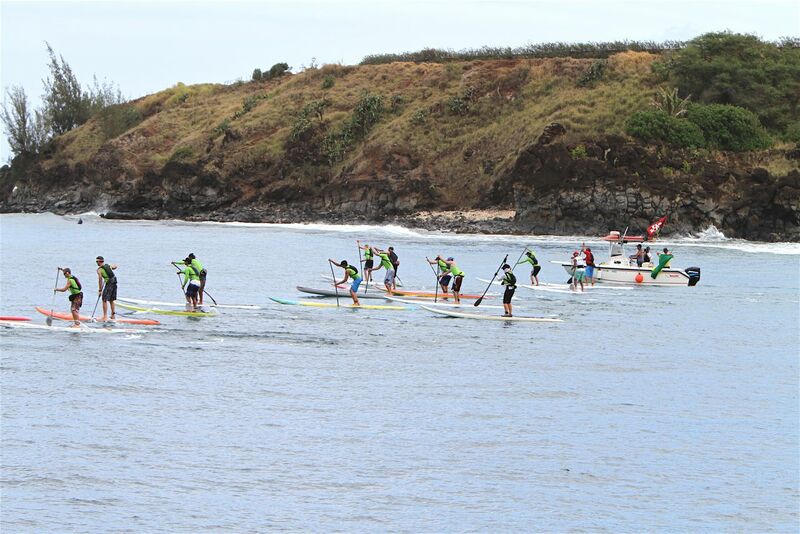 As for the pack leaders, Dave Kalama took a commanding lead with a straight line into the channel while cousin Ekolu went south and disappeared from the pack and appeared to be out of the race. 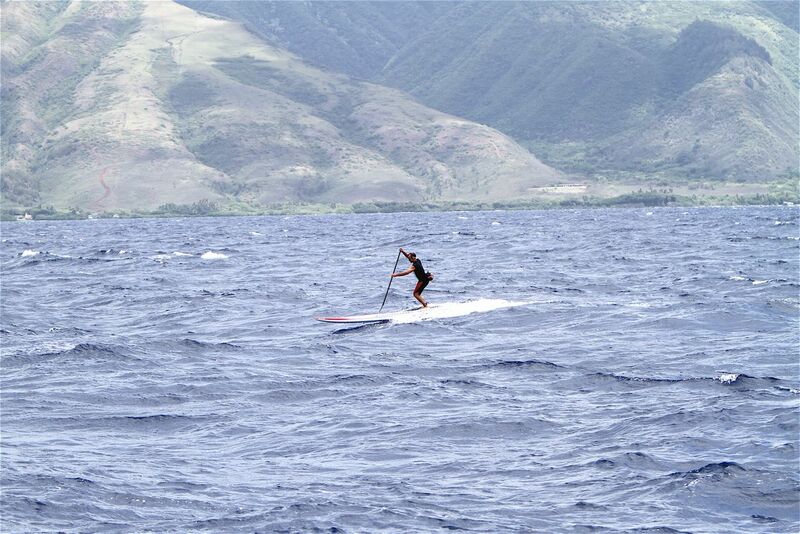 Baxter, Trudon, Raaphorst, Menelau and Moller all took a higher line toward Molokai Point and tacked their way closer to the swell line which ran parallel to the island. 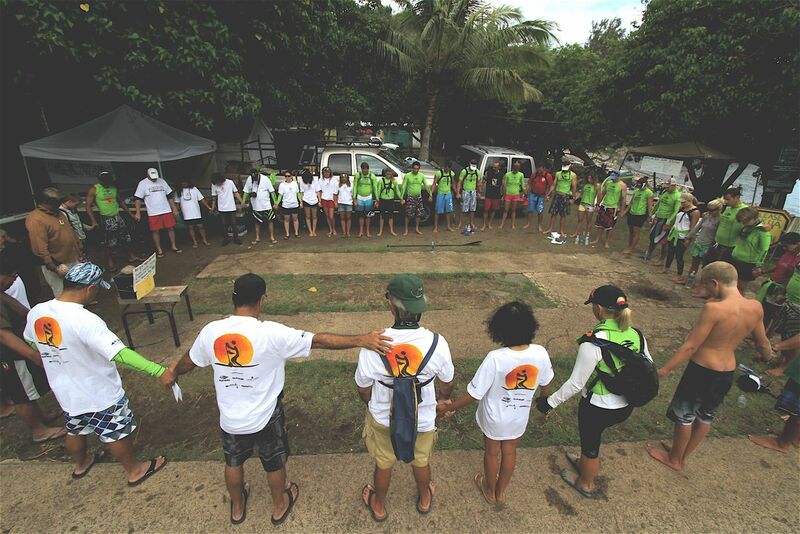 “But when we hit the line on Molokai, man that made me forget the whole first part. 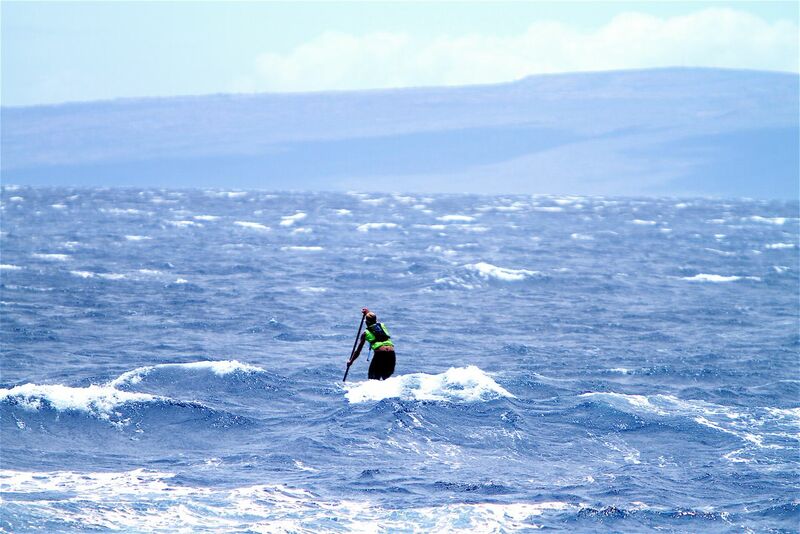 We were just running down the coast for about 8 miles,” which for the paddlers, was the last 8 mile stretch to the finish. That last stretch was where the pace of the race picked up as Dave Kalama and Connor Baxter battled for 90 minutes exchanging leads. Kalama had the lead up to that point but Baxter kept creeping in one him. Five lead exchanges made this one of the most exciting races on the open water with both paddlers gliding up to 25 yards past each other. Sixteen year-old Baxter finally got the better of the two and past the first Kaunakakai buoy, Ekolu Kalama came from way south and pulled 50 yards right outside of him and caught a “bump” for a 30 yard lead. Four miles from the finish, Baxter hit his stride after refueling from his boat crew and picked up a swell and rode for at least 200 yards and never let up putting everything he had on the line and raced to the end for an unbelievable time of 3:29:02 in winning the Elite and the 19 and under division. For Baxter, who dropped to his board right after crossing the finish line two words said it all, “I’m spent”. Mormaii is based in the city of Garopaba, in the southern Brazilian state of Santa Catarina, and has revenues of over US$ 30 million a year. In Brazil and abroad there are around 40 companies licensed to produce brand products. International licensees are present in Mexico, Portugal and Argentina, and there will soon also be one in Germany. A water sportswear lifestyle pioneer with almost thirty years of innovations in the sector, the greatest mix of products and the highest income among the brands in the surf market and water sports in Brazil. It all started with this differentiated wetsuit made especially for surfers. After that, clothing was produced for diving, jet-skiing, triathlon, windsurfing, and many other sports where the athletes adopted the Mormaii neoprene as the official equipment while in the water. The constant technological improvements and design of the neoprene items made this Brazilian brand have a good acceptance in every part of the world, being elected by the English magazine Wavelength as “the best wetsuit for surfing in the world”. Clothing, shoes and accessories are the other sectors where Mormaii acts and has excellent projection. Every season, Mormaii launches a new collection with winter and summer items, masculine/feminine/youth fashion commercialized throughout the whole country. For 30 years the brand has been strengthening its commercial partnerships by the participation of representatives, franchisers and licensers, among other collaborators. There are 26 Mormaii stores and five exclusive kiosks located in different parts of Brazil. Mormaii has approximately 20 thousand places where its products are sold, covering all the national territory. Outside of the country, the work Mormaii does is also active. Mormaii exports to approximately 50 countries such as Israel, France, Italy, Spain, USA, Mexico, Argentina, Chile, among others. Mormaii has licensed companies in the five continents. However, the Mormaii’s extension to the international market can’t be limited to sales, so the brand makes use of its marketing, using the same strategy that is a success in Brazil, such as the sponsorship of events, its participation in fairs and support of sports people. Being a reference in the surf world for its high quality wetsuits, Mormaii is already well-known in all sports sectors for keeping creating new products that solve problems. An example of that is the Mormaii Floater sunglasses, launched in 2006, that have a double utility, being able to be worn on a daily basis or for the practice of extreme sports, on the water surface. The Mormaii sunglasses are famous for their optic quality and modern design. Mormaii will keep its growth policy in the future, aiming at taking the best Brazilian products to more and more people, who use them to practice sports or simply to be in contact with nature. This healthy proposal has generated the success of this Brazilian brand. Standup Paddle Magazine is a Hawaii based media company whose goal is to promote the lifestyle of stand-up paddle boarding. 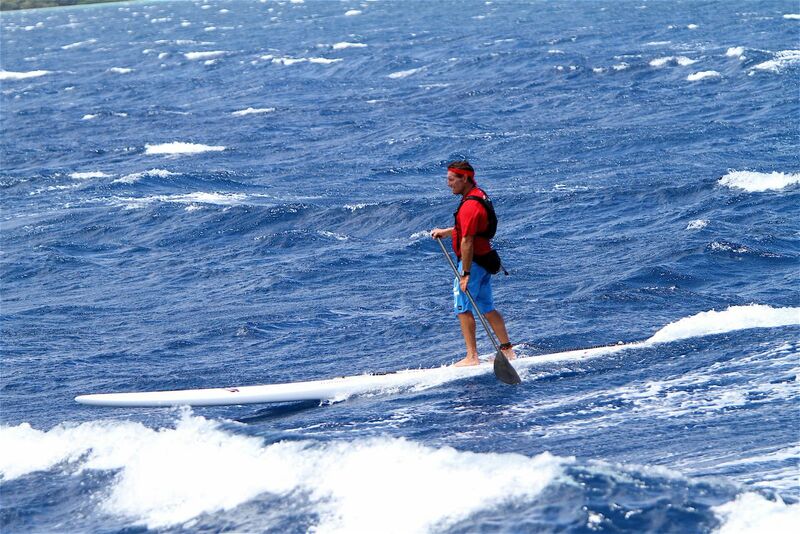 Distributed throughout the United States, Brazil, Canada, Australia, United Kingdom, Germany, Italy and France, it’s print magazine has taken the concept of “old dudes on big ol’ tankers and tandem boards catching all the waves”, to marketing ocean recreation in it’s purest form for “fitness, health and well being”. Within a twelve month period, the magazine has had extensive growth in distibutions, sales and marketing and today you can find it’s print media in most major SUP shops across the globe as well as Barnes and Nobles in the U.S. and at various SUP events around the world. Tahoe Race Series (Nevada, California), the Yolo Board Race Series (Florida), Hennessey’s Race Series (California), Rainbow Sandals Battle of the Paddle (Dana Point, California and Honolulu, Hawaii), Naish Paddle Championship (Maui, Hawaii), Hui O He’e Nalu Independence Day Race (North Shore, Oahu, Hi), Austin SUP Jam (Austin, Texas), Round The Rock Race (Seward Park, Seattle, Washington), Mormaii Molokai Pailolo Express Race (Maui, Milokai, Hawaii), Molokai2Oahu 32 Mile World Championship (Molokai, Oahu, Hawaii), Paddle to the Channel (Lake Havasu, Arizona), Coastal Urge Race Seires (North Carolina, Rhode Island), H2O Overdrive SUP CUP Series (Lake Jordanelle, Utah), SUP 11-City 136 Mile Tour (Fryslan, Netherlands). This entry is filed under Events, News, Races. You can follow any responses to this entry through RSS 2.0. You can skip to the end and leave a response. Pinging is currently not allowed.